We felt quite revived today for our ride into Krakow. 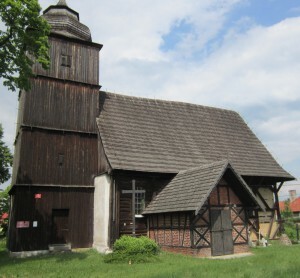 The route went on 791 to Ogrodzieniec – Pilice. Then along 794 through Wolbram, Trzycha, Wielinoza, Skata, Brotowka, Korskiewsku, to Krakow. 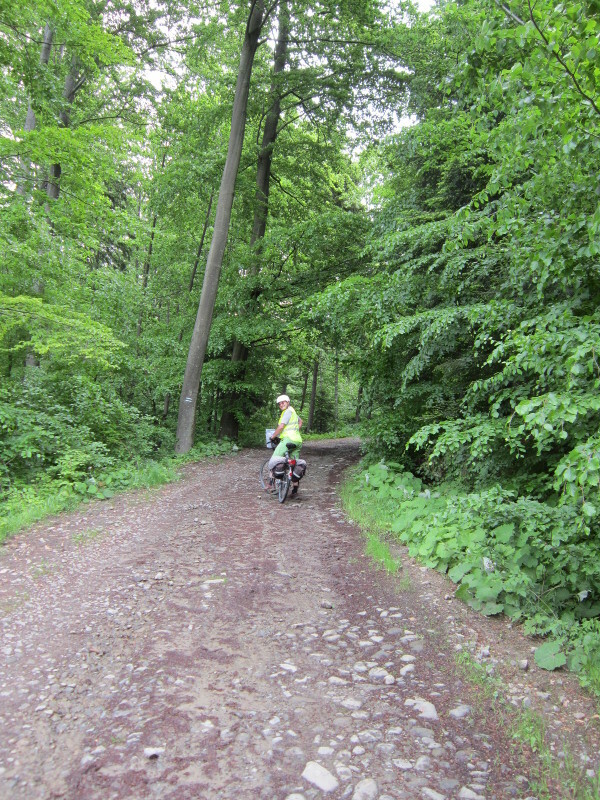 It turned out to be an easy 70km as we had a lot of downhill runs as we came closer to Krakow. We also noticed that the quality of the roads had improved today (fewer pot holes and patches), presumably due to our proximity to the big city. 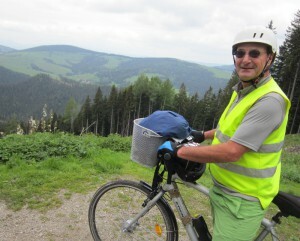 We also saw our first other bicycle tourists – one about 30km before the city and a second (a Frenchman) in the centre. The outskirts of Krakow didn’t look at all promising – with many ugly big square apartment blocks, congested roads and angry traffic. We circled around a bit to get into the centre and it started to rain quite heavily just as we arrived. We found a currency exchange, tourist information (for accommodation) and bookshop (for a map). Once these were sorted the rain had stopped and the place was looking a lot better. 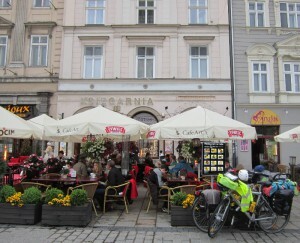 We decided to have a meal at an outdoor café on the main square. This was quite a treat, as they had outdoor gas fires that we could sit besides – nice and warm. We both had steaks and beer. 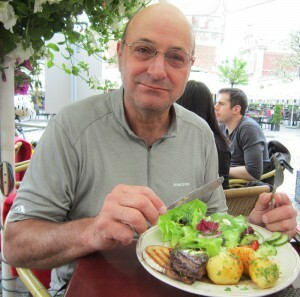 We know from previous experience how good red meat is when you are cycle touring. 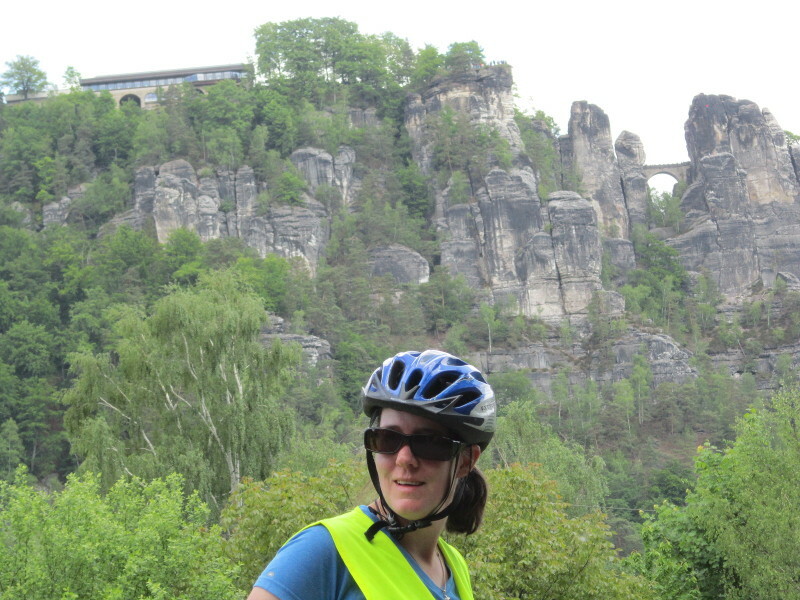 We then rode around to see the main sights. 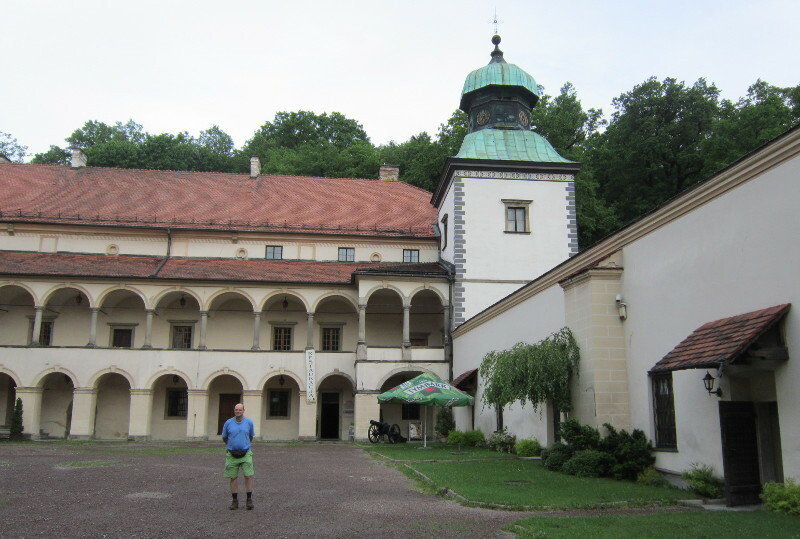 There were no tickets available for the today or tomorrow for the two things I would have liked to see – Wawal castle and the underground Krakow tour – so we just rode around soaking up the ambience. There are enough museums and tours to keep you busy for a week, and also horse drawn carriages, a real tourist Mecca. All the people in the centre seem to be tourists – we heard French and German, spoke to an Irish couple at the cafe and even saw some Indian and Chinese people. We talked to an eccentric solitary French cycle tourist. I guess we are eccentric too. We hadn’t come across many tourists during the rest of our trip – it seems that they are all concentrated in this one spot. 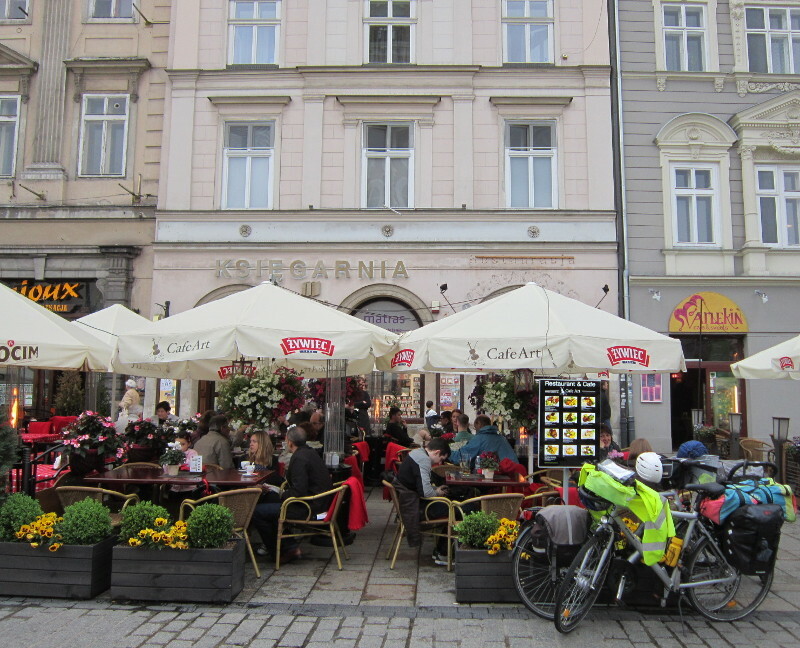 After seeing hundreds and hundreds of cycle tourists in Germany, we finally saw two cycle tourists in Krakow. 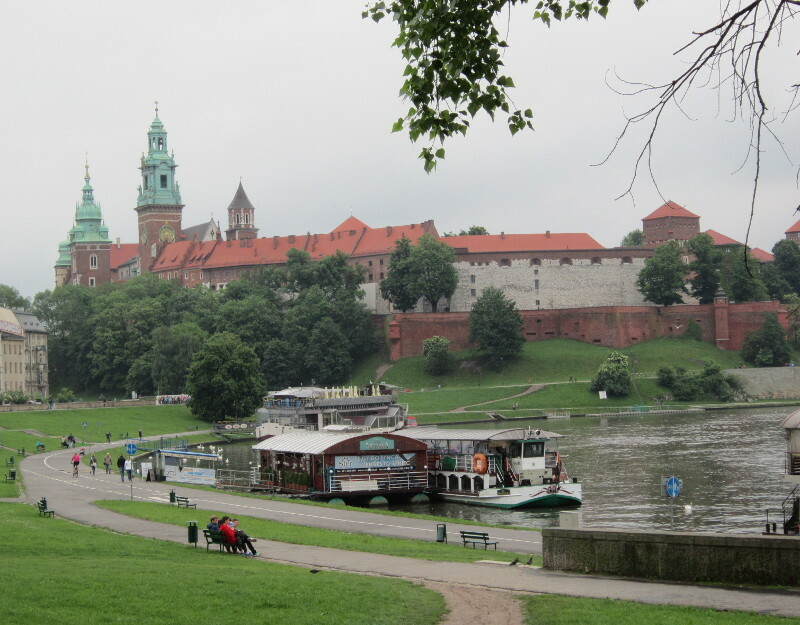 After checking into the Okay Hostel (couldn’t figure out if the name is marketing genius or idiocy), which is near the river, we rode around some more on our bicycle (another 15km in all around Krakow). 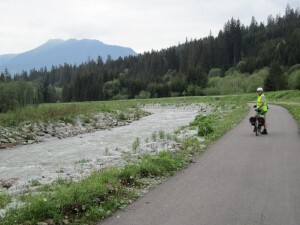 The nicest place to ride is on a bike path alongside the river. There are heaps of places to eat and drink. 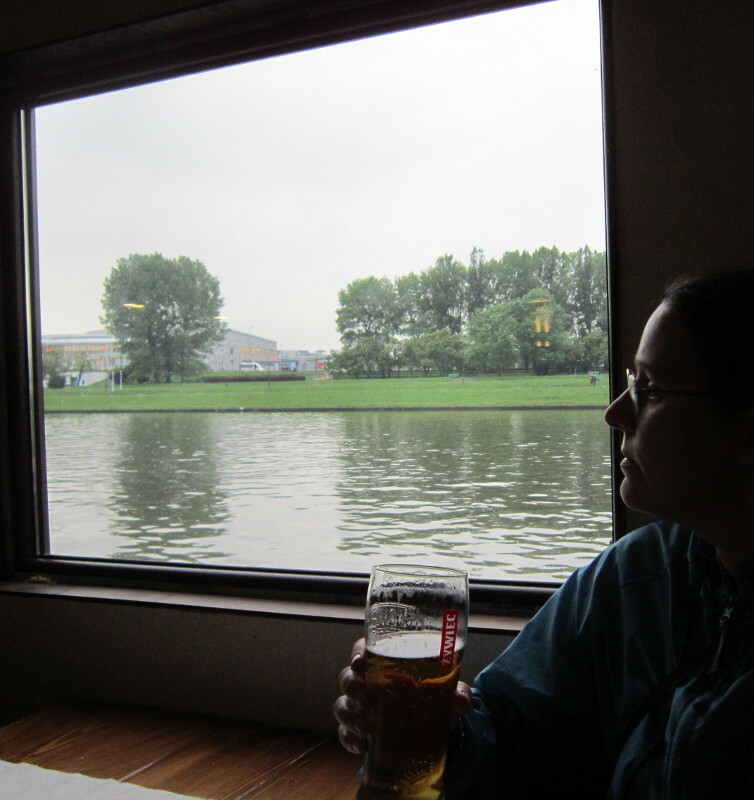 We had a beer on a boat restaurant (one of many) and found a superb delicatessen where we bought some snacks and red wine before heading back the the hostel. 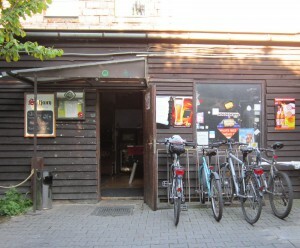 The Okay Hostel is up two flights of stairs (a disadvantage with bikes) but otherwise I would recommend it. 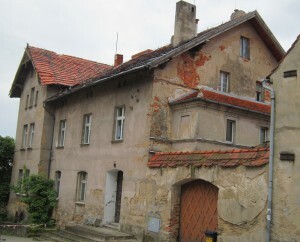 It is very cheap and based on the youth hostel model. We had our own room but shared a bathroom. It was not full, so not a problem. An advantage was that they had a washing machine that we could use to wash our clothes. Today we we had planned a shorter ride of 62km to Sucha Beskidzka south of Krakow. 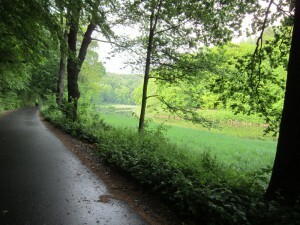 However this turned out to be long enough as we were in rain after the first hour and there were also a lot of hills. Our start was delayed as Kris got talking with the intelligent young Pole working at the hostel. It was very interesting hearing his views on Poland and European politics. He spoke about the challenge with Ukranian refugees. His grandfather was lucky not to be one of the 22,000 soldiers executed by the Russians (Katyn massacre) but was deported to Siberia during WWII. Eventually an agreement was reached that Poles could join the allied forces, but they had to get to the allied bases themselves. So they had to walk from Siberia to the border in Turkey. His grandfather survived but the friend he walked with did not. 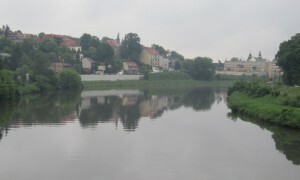 The start of the route was the most pleasant as we rode out of Krakow alongside the river for about 8km in overcast conditions. We headed onto road 953 through a series of villages where we encountered road works and it started drizzling. 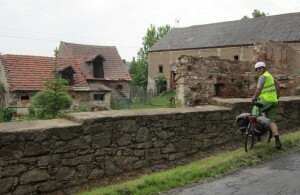 We eventually turned off at Kalwaria onto a quieter road. 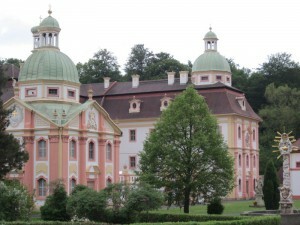 We passed a huge 17th century monastery on a hill. There were a number of tourist buses but no tourists in sight, it was raining and pretty miserable weather at this time. 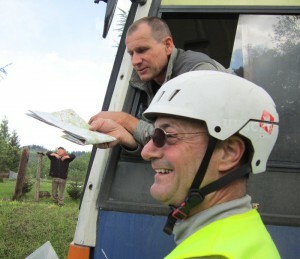 We were advised by a couple of people and also a map outside a hotel of a more direct route through to Sucha Beskidzka. This road was in very bad condition with lots of potholes and patches and also had lots of steep up and down hills – lots of them through forests. 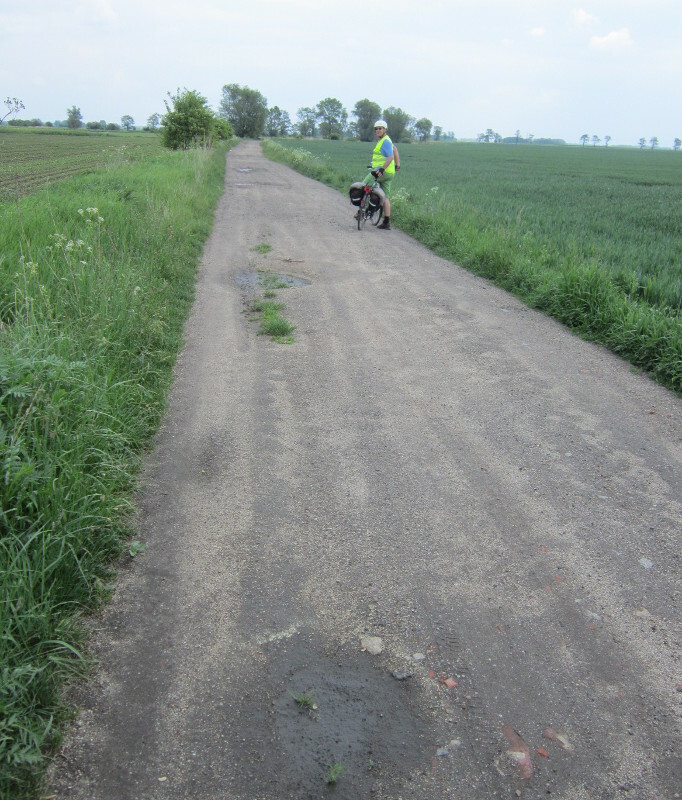 Road signs helpfully indicate the gradient, most were 9-12% but the highest was 14%. I had to get off and push my bike a couple of times. 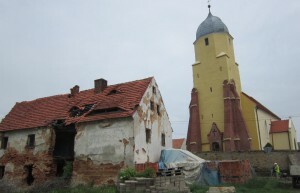 We were getting cold by the time we reached our hotel in Sucha Beskidzka. 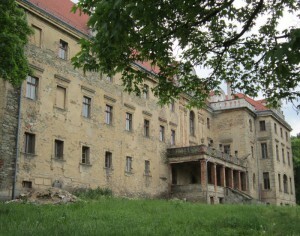 The hotel is on the ground floor of a Renaissance castle and is called Restaurant and Hotel Kasper Suski. We are finding the Polish prices very affordable – for example this hotel costs around NZD 50 for two including breakfast and wifi. I enjoyed getting warm and clean again. Kris did some maintenance on the bicycle brakes. 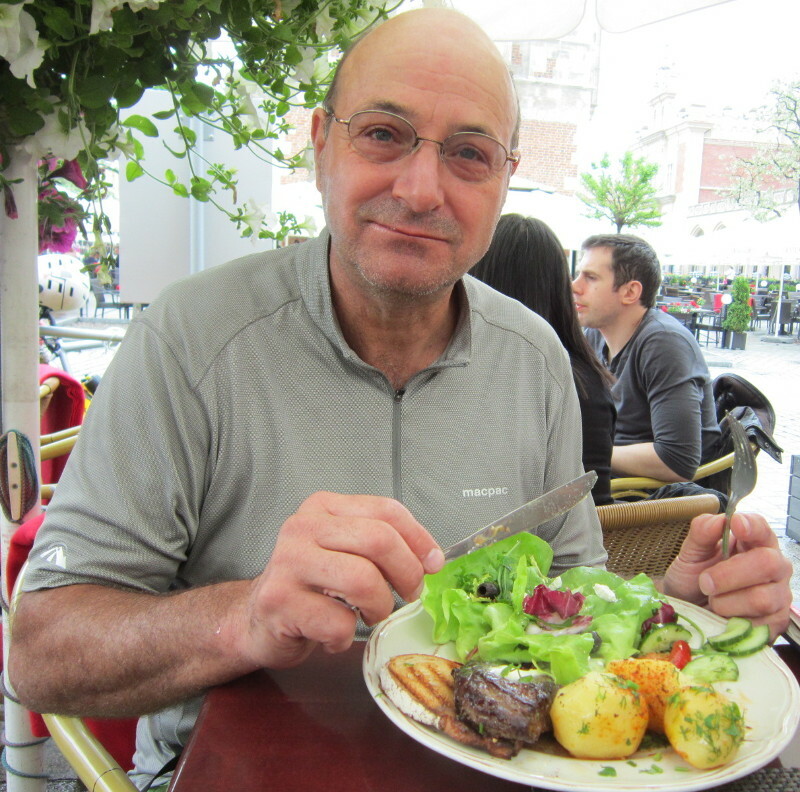 We had a three course meal in the hotel restaurant – I had trout which was delicious. Here is a photo of Kris adjusting bicycle breaks in the rain. We were relieved to wake up to better weather, the sun was even shining a for a few moments this morning. 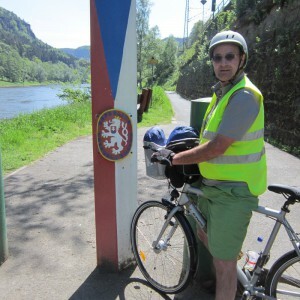 Today we did 83km from Sucha Beskidzha to Trstena in Slovakia. We took a little time looking around Sucha Beskidzha and spending the last of our Polish Zloty on new bicycle brake pads and orange juice for the journey. There were many little shops along the main street, an attractive town for tourists. We headed out of town to the west, alongside the train track and river. 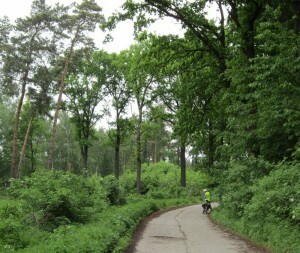 There was even a bicycle route for the first few kms. 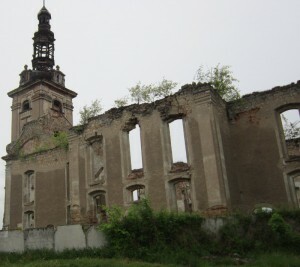 The first town past was Lachowice, then Jesowski Dzial, then Hucisiko. There were a couple of steep hills (both up and down). Here we had a little adventure at an unmarked intersection. Kris wanted to continue following the train track but wanted to make sure we were on the right road. He stopped to ask a man mowing a lawn nearby, who seemed to indicate we should go back the way we came (which would be a long steep uphill, so we were not keen). A bus then stopped and the driver began to speak to me. He turned out to be Russian, with only a few words of English. Anyway, he was helpfull and a conversation ensued between Kris, the man mowing the lawn and the bus driver. Another man (pedestrian) also stopped and joined in. Eventually a consensus was reached that we could go either way. We said that we wanted to go on and then bus driver told us to follow him in the bus. So Kris and I were riding behind this yellow bus, which was soon on a gravel roads with potholes, through a forest, pedalling with effort to keep up! He stopped the bus about a kilometre up the gravel road and directed us from there. He had his daughter, who can speak English, translating for him on his mobile phone at this point. 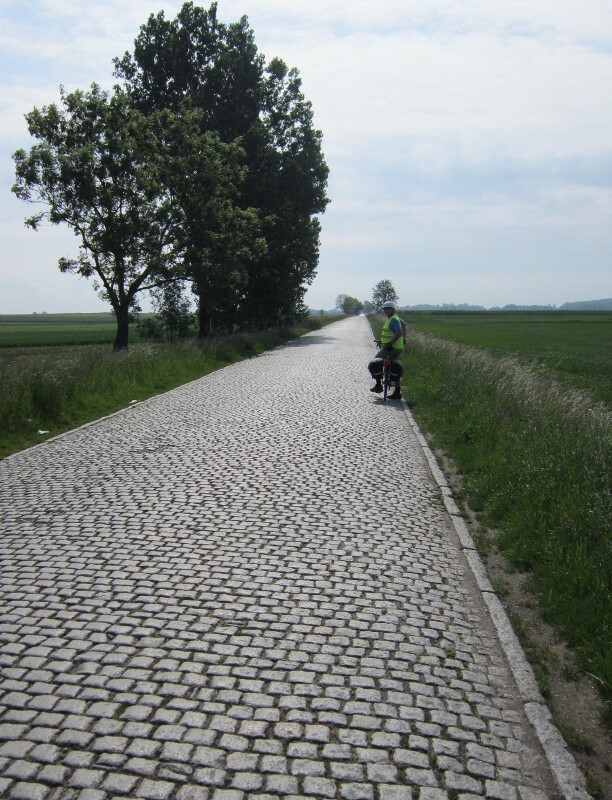 The instructions were to continue up the gravel path for about 1km, turning right at the first main road we came to. Then we would have a long downhill. After ten km, were told to turn left at the next major intersection. Then to keep going until we reach Slovakia. The directions worked out pretty perfectly even though it was a bit different from the route we planned. Here is a photo of the gravel road we took through the woods. It is a short-cut not shown on any map. 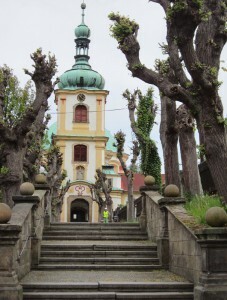 The road to Slowakia took us through lots of little tourist settlements, very pretty and green. There was lots of accommodation around, we suspect for winter skiing. 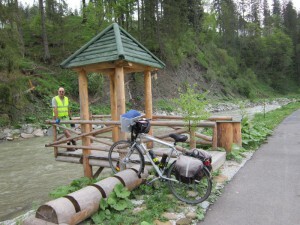 The route was the 945 (which was part of our planned route), which is called the 521 in Slovakia. There was a long long hill climb just before the border, going through forests, where there was some logging going on, and alongside a little stream. The border is on the top of the hill and it is all downhill from there. Our first impression of Slovakia is that it is very scenic. We passed a flock of sheep some of which had bells around their necks, so they were clinking as they grazed. There were also regular road-work stops along the route. 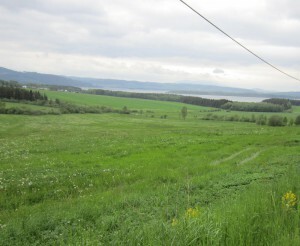 We reached a huge lake called Orava about 20km from the border. 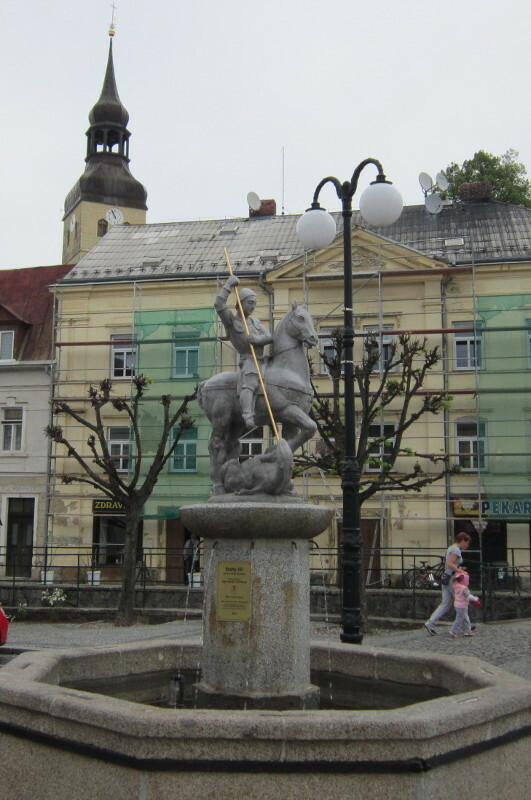 The main town on the lake was Namestovo. It was getting really cold at this point (less than ten degrees Celsius). We pressed on around the southern side of the lake, crossing a dam wall with hydro generators. 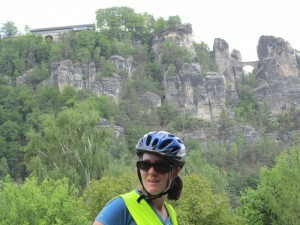 There was a final hill climb just before we got to the town of Trstena, where we are staying. Here is the view looking back at the lake from the top of the climb. 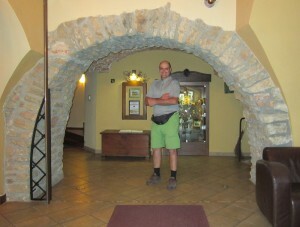 We were feeling cold when we stopped at the Trstena tourist info and in a hurry to find our hotel. Luckily it was really nearby, and we have a huge room with heaters! 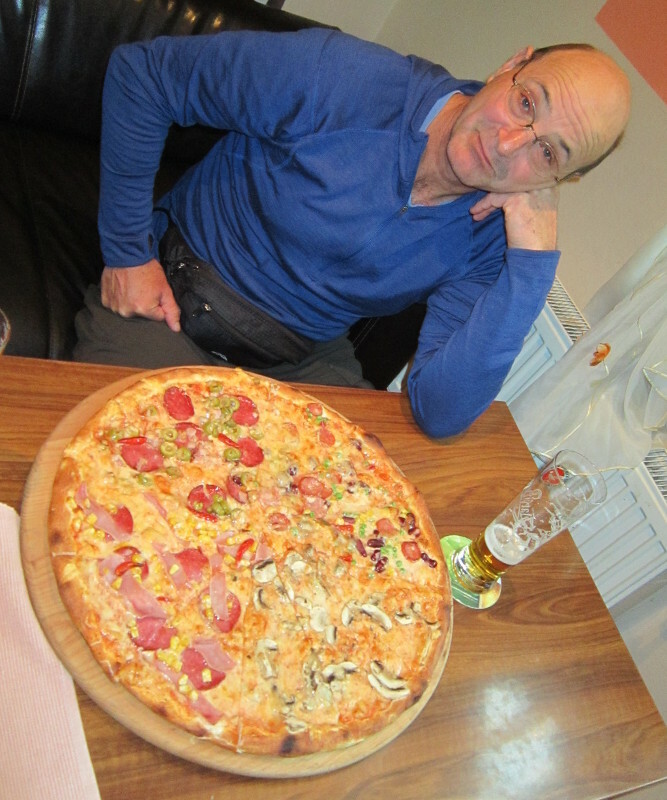 After cleaning up we went to the pizza cafe at the bottom of the hotel and bought the biggest pizza we have ever eaten (50cm diameter) and also some draught beer. The draught beer cost less than NZ$2 and the pizza around NZ$15. And yes we did eat it all and it was good. Today was a real treat – a manageable 64km ride through super scenic Slovakian countryside, with good roads and little other traffic. We started out going west along the 520 from Trestna, passing through the towns of Liesek and Cimhova. Here we noticed loadspeakers broadcasting music along the main street again. We first heard this when we entered Trstena and find it very intiguing. 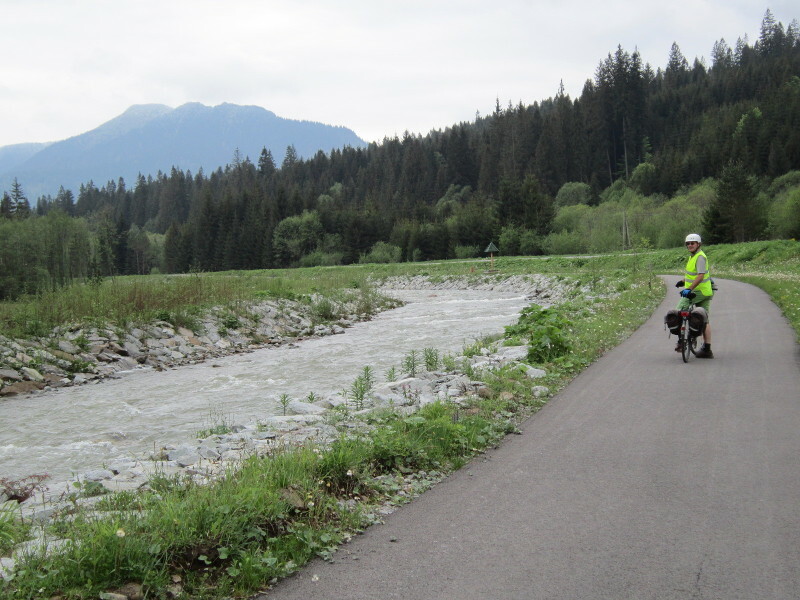 At Vitonova we turned onto the 584 to follow the Oravica river south. 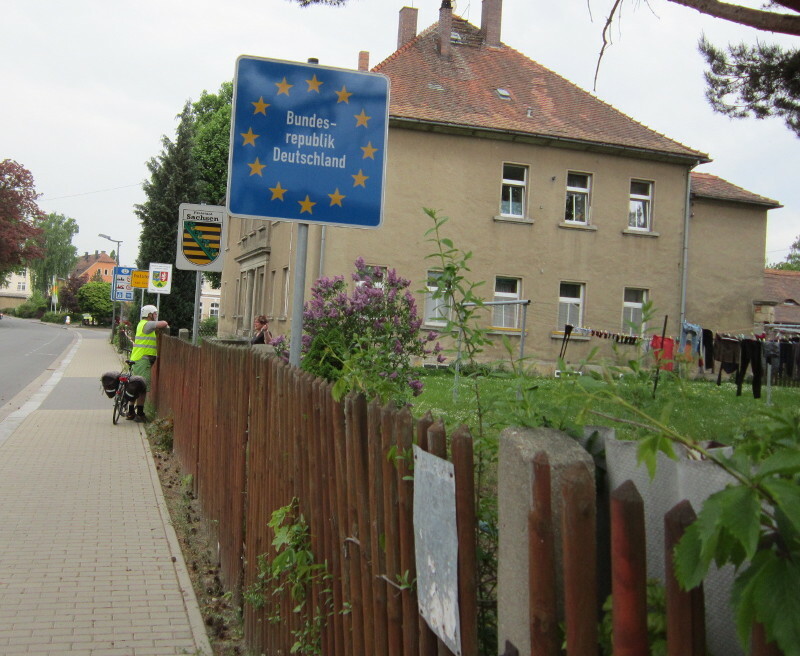 Here we also passed heaps of accommodation, mainly bed and breakfast advertised on private homes, the reason became apparent when saw a ski lift just as we were leaving the town. Along the 584 we found a wonderful cycle track, the best cycling infrastructure we have seen since Germany. It came to an end at a large ski park that had a ski lift and large warm water spa (you can just imagine it buzzing in winter). 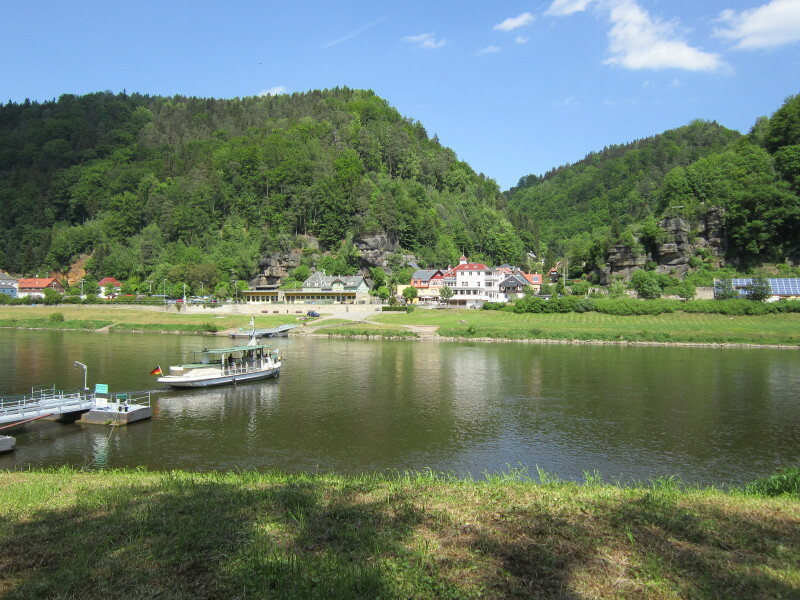 It was a clear but cold day, so we stopped for a coffee at Zuberec in working mans cafe – there were heaters on alongside the tables and I could warm up my feet. Even though it was only 11am, there were a couple of workers there eating very hearty looking food and some more came in while we were there. 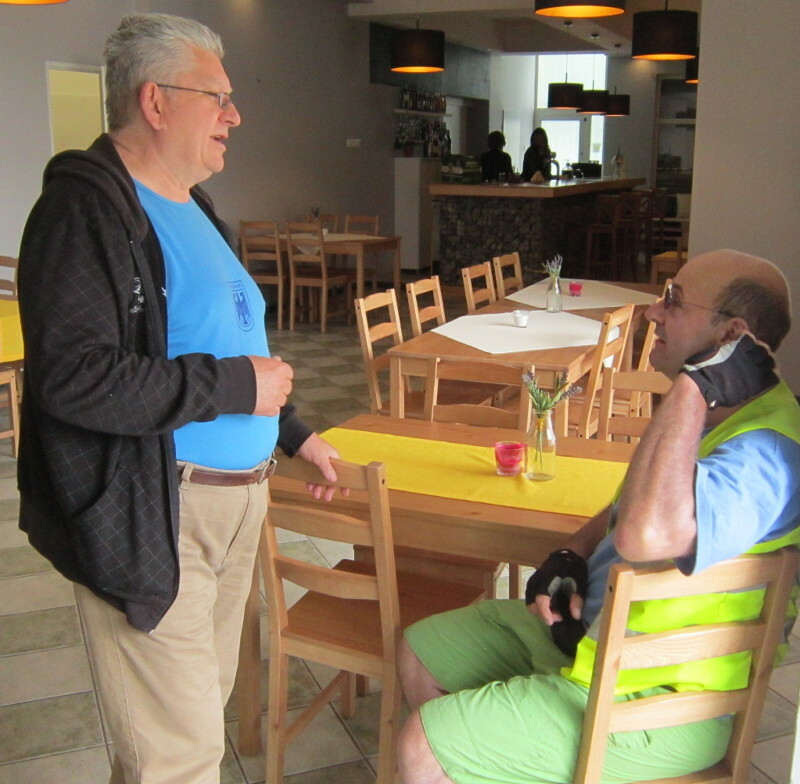 We were very tempted to try the food, but it wouldn’t have been a good idea to eat a big meal while cycling. A little while later we stopped for another coffee at a smart cafe along the mountain pass – just before a steep climb! This was a newly built lodge, all made out of wood with sheepskins hanging from the rafters, a roaring fire and stunning views. The patrons were business men and day trippers. 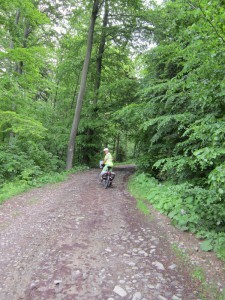 We had a long climb to the top of the mountain in low gears, and then a wonderful downhill run. 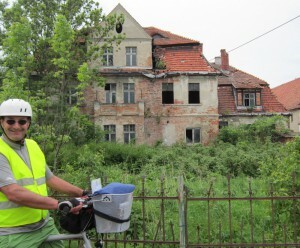 We cycled through Liptovske Matiasouce, Liptouska Sielnica, and then to Liptovsky Mikulas. We passed a huge hot bath/ water park/ zoo/ movie entertainment complex just before town. 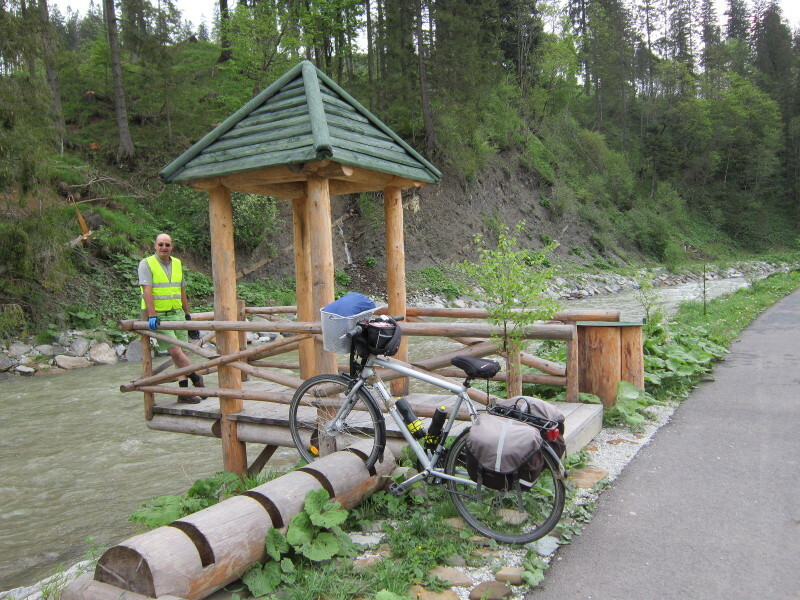 The sun came out and it warmed up as we arrived in Liptovsky Mikulas. The town had a very smart tourist office with a young lady who could speak good English (it seems like tourism is one of the main industries here). 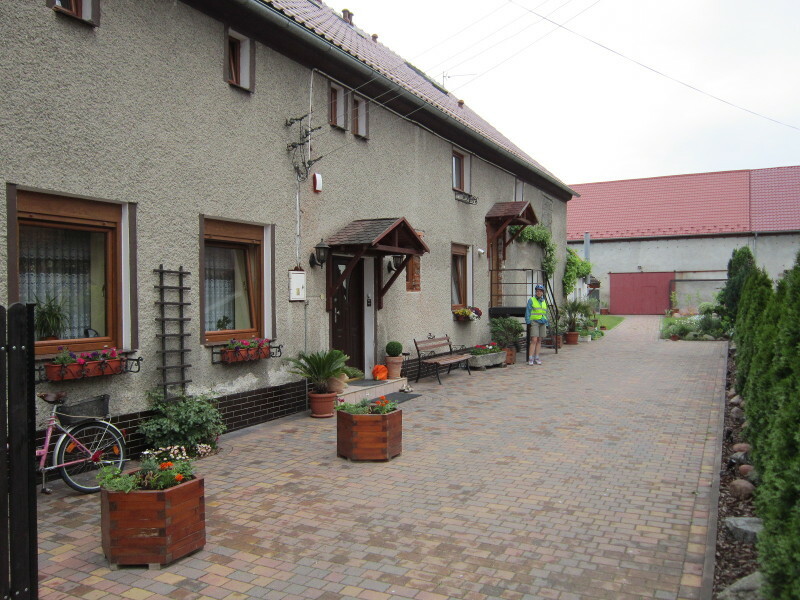 She helped us organise our accommodation at the Penzion Boniface. 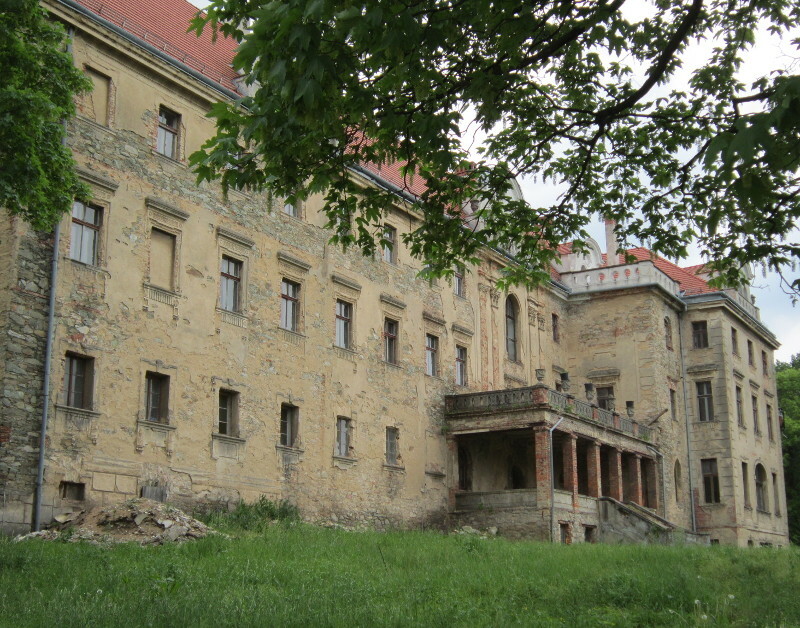 The main bonus of this place was that it has a huge bath (only showers up to now) – so we could have a good soak. 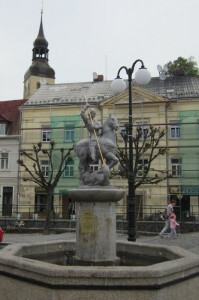 The town has a large central pedestrian area with cafes and bars. 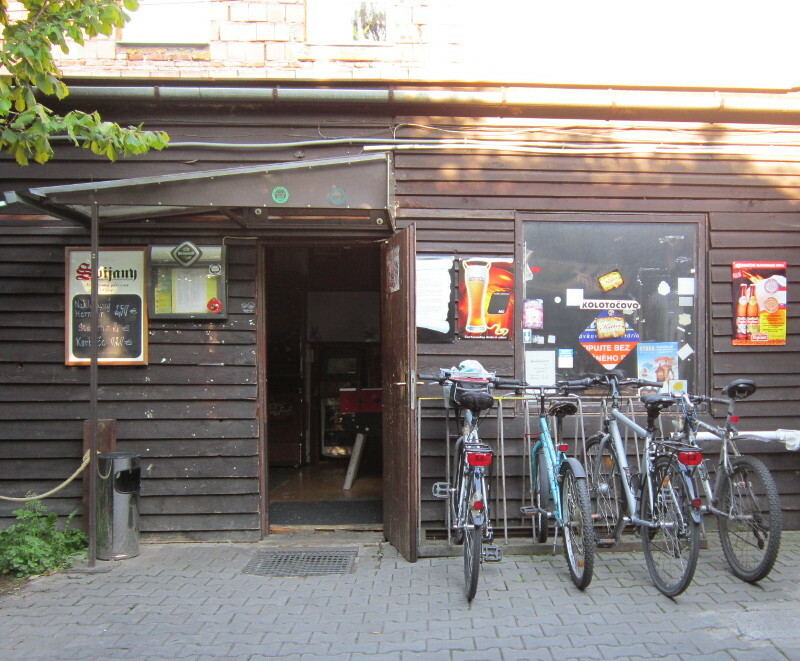 We found a “beer garden” down an alley off the main area – with parking for bicycles right outside. The bar man called someone over who could speak English from among his customers to help us chose a beer, and we ended up with a very good beer that rivals any Wellington craft beer. We enjoyed sitting outside alongside the locals – and especially some of the music, that was some sort of Slovakian rap/ rock. We had dinner at a traditional style restaurant not far away – cabbage soup and a shared plate of local specialities – potato dumplings in sheep cheese sauce and cheese filled dumplings, something like ravioli. It was very good, just the type of thing you can imagine eating after spending the day on the mountains with your sheep. We finished our evening off with another beer at our new favourite pub.